There are some venues in Yorkshire that are utterly charming but maybe none so much as the beautiful Newburgh Priory in Coxwold near York. As we approached the little village of Coxwold, it was clear to see where the village ended and the estate began by the manicured topiary yews lining either side of the road. After passing a slight bend in the road, there lay the entrance to the house lead by a long, straight driveway, either side, two very large yews had been shaped into crowns. It certainly does feel like a regal venue to us. Still owned, run and loved by the Wombwell family, the grounds are immaculate. The north facing front of the house is dramatic and overlooks the man-made lake, lawns and The White Horse of Kilburn, whilst the short walk around the ruins of the priory to side of the house have their own wonders to admire. The path is adorned either side with topiary yews of rabbits and ducks and leads to the grand lawns on the south facing, much softer facade of the back of the house. Newburgh Priory is a venue that gives you true flexibility. You can be married inside the house itself in one of the beautiful Georgian rooms, or for wedding parties larger than 100 you can have a ceremony to suit your needs. As with venues across the UK, outdoor weddings are not legally binding, but with the legalities completed at a registry office before hand, you can hold a stunning blessing in a variety of places on the estate; a wedding ceremony by the lake, a wedding in a marquee overlooking the manicured lawns or in the ruins of the priory, a garden wedding and even a woodland wedding – this venue offers it all. Newburgh Priory weddings – the place where memories are made! Our photos don’t do the venue the justice it deserves and to truly appreciate it, we would recommend a visit. If you would like us to arrange this on your behalf, please do get in touch – we will be happy to help. We are fast approaching one of my favourite times of year – Spring. As I write this blog for you on Spring Wedding Inspiration, I have a vase of gorgeously bright daffodils smiling at me and I thought before the season arrives in full, why not share some inspiration with you of what you have to look forward to! Spring is about colour, pastels, bright waves of yellows and peachy pinks – what’s not to love about this time of year, and that’s not to mention the delicate blossom that will soon line the streets. Little baby lambs in the fields (obviously visible from your beautifully placed marquee, yurt or teepee in the Yorkshire Dales!) and a general optimism that the UK weather system may have some rays of sun to offer this year. Go on, indulge yourself…. Just to start you off – How lovely do these cupcakes look? 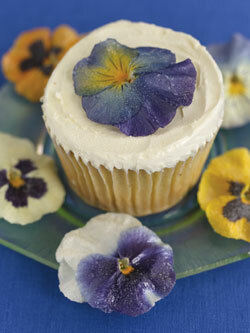 Topped with edible pansies! We were utterly charmed by Newton Grange when we were kindly shown around by Rachael on a recent trip into the Dales. Situated in close proximity to Skipton, this beautiful venue gives you more than just a field with a stunning outlook – it certainly does give you that, but much, much more. The beautifully restored Georgian House and surrounding land is exclusively available for couples wanting to create an intimate day for their guests, and with the choice of three fields surrounding the house, you can have the freedom to create a day that truly reflects you as a couple. Whether you are looking for a luxury marquee to sit on the manicured lawn, a teepee to sit in the large bottom field overlooking the beautiful scenery, or a yurt to attach to the house to increase your space for more intimate weddings – if you can imagine it, it can be created here! To further add to the charm of this venue, there are five separate cottages available for your guests to stay in – including the rooms in the main house, there is space for 32 people. Imagine your nearest and dearest gathered around you, helping you prepare for your big day and then relaxing the day after, reliving the dad dancing and going for a stroll on the Leeds – Liverpool canal. A perfect weekend – beginning, middle and end. If you would like to know more about this venue then you can call Rachael from Newton Grange on 01756 748140 or you can give us a call and we can give you a run down of this beautiful venue! Being lucky enough to live in Yorkshire and regularly being spoilt by the dramatic landscapes, we couldn’t imagine a more perfect place for a couple to tie the knot and party away into the early hours. For some couples, getting married outside means they can have a ceremony without restrictions or religious traditions being imposed upon them. Holding a wedding ceremony outside is the perfect balance for couples wanting a ceremony that is intimate, memorable and most definitely private. From woodland weddings set in the heart of North Yorkshire to ceremonies held in gorgeous teepees in the middle of a wheat field, the best thing about an outdoor wedding, is that you can make it everything you want it to be with a few ground rules. Legally binding ceremonies cannot currently be held outdoors in the UK unless they are conducted in a fixed structure – for example, some hotels will allow you to get married under the entrance of a summer house in their grounds, but not outside of the summer house. To hold an outdoor ceremony, you still need to complete the ‘legal’ bit at a registry office. We always recommend to our couples that they make this section as unromantic as they want it to be with the minimum witnesses for the documents – normally the day before, or a couple of days before the actual wedding. We can recommend a fabulous Yorkshire based company for your ceremony writing and conducting needs! The best thing about an outdoor ceremony, is that you aren’t constrained by the usual parameters of a civil or traditional service- you can be as true to or as far away from a traditional service as you want it to be – if you want to exchange rings, say ‘I do’ and have a kiss, then it is your choice. Often in a church or even during a civil ceremony, there are elements that can not to be changed to suit you as a couple. Hiring a professional company to help you write your vows, deliver the ceremony and guide you step by step through each element of the process will leave a lasting mark on both you and each and every one of your guests. We’ve left you with a few photos to inspire you to hold an outdoor ceremony and after party – at least in the middle of a field, you won’t have any hotel neighbours complaining the noise is too loud!